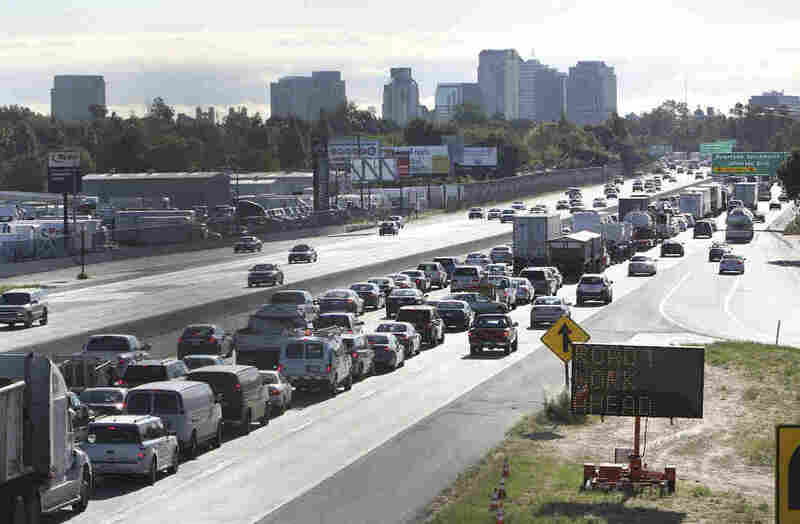 White House Proposal Rolls Back Fuel Economy Standards, No Exception For California Government agencies have released a proposal to freeze fuel economy and emissions requirements for six years. The proposed rules would also block California from setting its own, higher standards. California argues it should be allowed to set its own fuel efficiency standards. The Trump administration has proposed a rollback of Obama-era fuel efficiency and emissions standards, while simultaneously taking aim at California's unique ability to set more stringent rules. Under the Obama administration, the Environmental Protection Agency called for the fuel economy standards for new vehicles to ratchet up over time. The increasingly strict standards were designed to combat climate change by reducing greenhouse gas emissions. On Thursday, the EPA and the National Highway Traffic Safety Administration released a new proposed rule that would instead freeze the standards at their 2020 levels for six years. "Cars and trucks are just part of the basic fiber of the American economy and the American experience, so we take what we're doing very, very seriously," Bill Wehrum, EPA assistant administrator, told reporters on Thursday. The agencies say that increasing fuel efficiency requirements contributes to an increase in the cost of new cars and trucks, which may discourage consumers from buying new vehicles. Because newer vehicles have advanced safety features, the administration argues, increasing fuel economy requirements therefore harms highway safety, as well as having economic effects. Consumers Union, the advocacy arm of Consumer Reports, challenged the administration's argument that freezing the standards promotes safety by making newer, safer cars more affordable. "Given this administration's dramatic lack of progress on auto safety, and the auto industry's proven ability to improve safety and fuel efficiency at the same time, it is troubling at best that this rollback was made under the guise of safety," David Friedman, vice president for advocacy at Consumer Reports, said in a statement. The EPA has also argued that the federal standards imposed by the Obama administration are burdensome on auto manufacturers. However, "major automakers have repeatedly said they do not back freezing the requirements but have called for changes to take into account fuel prices and shifting consumer demand," Reuters says. The proposed rules also call for eliminating California's power to set its own auto emissions standards, a powerful tool the state has used to try to curb greenhouse gas emissions. Because of a federal waiver, California has been allowed to set its own tailpipe emissions standards that are more stringent than federal law. This is a privilege that California alone has, as NPR reported: "Other states can follow California's lead or the federal government's lead but they aren't allowed to strike out on their own." The proposed rules call this practice a "fundamental and unnecessary complication" to regulations, and proposed replacing them with a less-stringent set of rules applying to all 50 states. "California will fight this stupidity in every conceivable way possible," California Gov. Jerry Brown said in a statement on Thursday. California Attorney General Xavier Becerra called the proposed rules "a brazen attack, no matter how it is cloaked, on our nation's Clean Car Standards." At least 12 other states have adopted California's standards, and together they form a powerful unit. As NPR's Nate Rott reported, "together they account for a third of all car sales in the U.S."
California, 16 other states and the District of Columbia sued the EPA in May in anticipation of the EPA action, NPR has reported: "The states are asking a court to review the EPA's proposed actions, arguing that they violate the Clean Air Act." Now Becerra is planning to lead 19 attorneys general in a new lawsuit against the actual proposal. California prides itself as a pioneer in pushing for clean air — an approach that was born out of its own severe air pollution issues. In the 1940s, the smog was sometimes so thick in Los Angeles that visibility was just three blocks, according to the California Air Resources Board. For decades, the state has argued that it needs stricter standards "due to California's unique geography, weather and expanding number of people and vehicles," CARB adds. California has already reached its emissions reduction target for 2020. As the Los Angeles Times reported, it has "hit its target to reduce greenhouse gas emissions below 1990 levels." Now, it's trying to cut emissions even further, aiming for an additional 40 percent by 2030. But automobiles are, by far, the largest source of California's greenhouse gas emissions. And as the Times reported, those numbers have been rising. California's regulations also require car companies to produce and deliver a specific percentage of vehicles that are zero emissions — a framework that other states have also adopted. Some conservative groups have welcomed the proposed rules. Brent Gardner, Americans for Prosperity chief government affairs officer, said in a statement that California's higher fuel standards — and its electric vehicles mandate, in particular — impose costs on carmakers that ultimately are passed on to all consumers. "Someone in Oklahoma should not be forced to pay more for their truck to subsidize someone's Tesla in San Francisco," he said in a statement. Meanwhile, a group of 10 health and medical organizations, including the American Lung Association, called the suggested policy change a "step backward" in the fight against climate change. "From degraded air quality due to higher temperatures to increased risk from wildfires, climate change poses serious threats to all Americans, especially to the most vulnerable, including children, older adults and those living with chronic diseases," the groups said in a combined statement.